The Ravenscar Dynasty by Barbara Taylor Bradford. The following day, Lily had asked herself why she had become so quickly entranced by this young man, one who is obviously so much younger than she. And she had known the answer immediately. 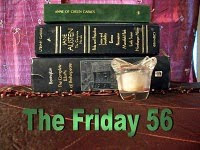 The Friday 56 is hosted by Tonya @ Story Time With Tonya and Friends. You can find the rules here. Happy Friday! @ juju: this is my 1st time to read BTB.. Interesting! I have never read anything by Barbara Taylor Bradford. Oh, I can relate to that! Perfect tease! Now that's what I'd call being honest with yourself! :-) Great teaser. Ooooh, sounds steamy! Intriguing teaser!